Cultural-tour equivalent of Bhutan’s most challenging trekking route, the Snow Man Trek in the high Himalayas. Provides a very comprehensive picture of the Kingdom – apart from history and culture, the different lifestyles of the people in each valley not to speak of immeasurable natural beauty and a plethora of flora and fauna along the way. Highlights: Spectacular views of Mt Everest (8,848 m), Kanchenjunga (8,586m) and Lhotse (8,414 m); and a literal adrenaline-pumping landing on the roof of the world. Travel by Druk Air, Bhutan’s national airline, to Paro, the country’s only international airport. The flight is exhilarating to say the least, as the route traverses parallel to the mighty Himalayas enabling passengers to see the world’s highest peak, Mt Everest, and many more. The descent affords a panoramic view of Bhutan’s foothills culminating into a thrilling landing at what is considered one of the world’s most challenging airports. Meet your guide at the airport and head to the hotel for lunch. Devote the afternoon to sightseeing around the Paro valley famed for its natural beauty, historical monuments, agricultural farms and quintessentially Bhutanese village communities. Visit the National Museum, formerly a watch tower, and then the Castle on a Heap of Precious Jewels or Rinpung Dzong. Wind up the day with a stroll around Paro town. Overnight at the hotel. Highlights: Hike to the Tiger’s Lair, the most famous Buddhist monastery in the Himalayas, built on a sheer rockface. After breakfast, drive for half an hour and start hiking up to the temple that is renowned in the Himalayan Buddhist world as one of the most popular sites of pilgrimage. The five-hour round trip follows an ancient but oft-trodden footpath flanked by water-driven prayer wheels. The temple, precariously perched on a hair-raising ravine about 1,000 metres above the valley floor, is considered sacrosanct as it was in a cave within this temple that the eight century tantric saint, Padmasambhava, subdued the evils who obstructed the teachings of the Buddha. The saint is believed to have come to Taktshang in a fiery wrathful form riding a tigress. Over the years, many Buddhist saints have meditated in and around the temple and discovered numerous hidden treasure teachings. Visit the ruins of Drugyel Dzong enroute. 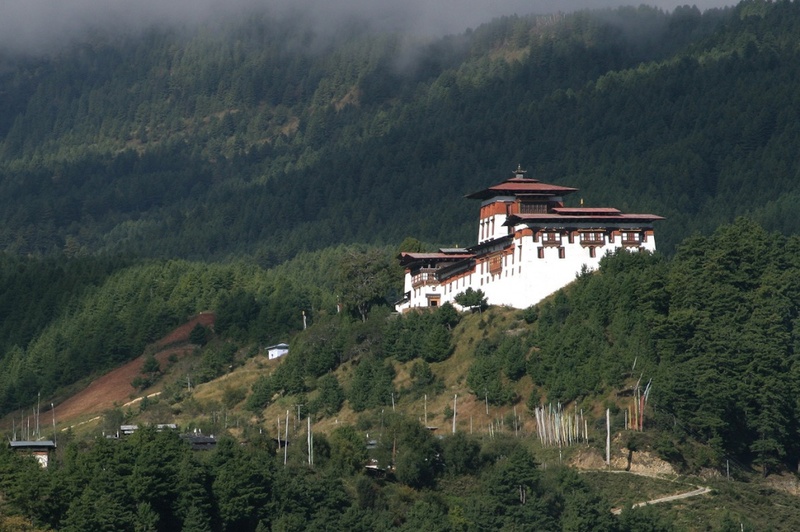 The fortress known as the “Castle of the Victorious Drukpa”, is a symbol of Bhutan’s victory over the Tibetan invasions in the 17th and 18th centuries. We can also get a view of the sacred mountain, Jumolhari, along the way. On the way back to our hotel, we will visit the 7th century Kyichu Temple, believed to have been built on a place that resembled a knee of a giant ogress. Highlights: The power centre and the capital city of the Happy Kingdom. Also the hub of commerce and culture. The drive from Paro to Thimphu is just under an hour. There are great many places to see in Bhutan’s capital. In the morning we will drive to Buddha Point which provides a spectacular 360 degree close-quarter view of entire Thimphu and the adjoining areas. This is the site of the world’s tallest statue of Shakyamuni Buddha. Our next destination is the 12th century Changangkha Temple, Takin Zoo and the viewpoint at Sangaygang. On our way back, we stopover at a nunnery, the Folk Heritage Museum and the Textile Museum. After lunch, we will proceed to Tashichho Dzong, a 17th century castle-fortress which today houses the offices of the King, Chief Abbot and government ministries. We will also take the opportunity to see the nearby parliament complex, the School of Arts and Crafts, vegetable market, and then spend the rest of the day watching an archery match and strolling around the town. Highlights: A panoramic view of the snow-capped eastern Himalayas and a multitude of alpine flowers and birds; Bhutan’s ancient capital and Temple of Fertility. The three to four-hour drive from Thimphu traverses thorough a constantly changing kaleidoscope of vegetation, waterfalls, flowers, mountains and meadows. In about 45 minutes we will reach the famous Dochula pass (3,100m) where on a clear day we can see the entire eastern Himalayan range, teeming with 6,000m to 7,554m snow-capped mountains. The pass also known for its abundant species of extremely beautiful flowers has 108 Buddhist stupas exquisitely built around a mound, adding to the natural splendor of the place. From the pass we descend to the sub-tropical valley of Punakha. Punakha served as the ancient capital of capital and still possesses the country’s main treasures in the form of Buddhist relics. Resembling a gigantic ship on an ocean floor from afar, and girdled by two (Male and Female) rivers, the castle-fortress also represents the best specimen of Bhutanese architecture. After lunch in a small nearby village together with a rural farming household, we will walk along a footpath flanked by an endless view of ripening paddy fields to the Temple of Fertility – Chimi Lhakhang. This temple, built in the 15th century to honour the “Divine Madman”, a saint iconoclast who is also associated with phallus worship, attracts barren couples from all over to receive fertility blessings from an anointed phallus. Before heading for Trongsa in central Bhutan, we will visit the ruins and reconstruction work underway at Wanduephodrang, a fortress which was built in 1638 but was gutted in 2012. We take a short leisurely stroll in Wangdue town. If lucky, we might be able to sight the White-Bellied Heron cavorting on the river bank. This is one of the rarest birds in the world. The journey to Trongsa is a gentle climb, from the sub-tropical to the sub-alpine region with the highest point at Pelela Pass (3,300m) Consequently, we will notice the vegetation transform right before our eyes. To reach the pass, we will be skirting the periphery of the world’s largest winter habit of the exotic and the rare Black-Necked Crane. Pelela pass itself is historically significant as the boundary between eastern and western Bhutan before the country was unified. From Pelela we drop to the slightly lower valleys inhabited by the semi-nomads who live off yaks and whose lifestyles have largely resisted the forces of modernization. After lunch at the 18th century Chendebji, a replica of the Boudanath Stupa in Nepal, we continue eastward to Trongsa proper, the bastion of the powerful governors in ancient Bhutan who eventually unified the country and became the progenitors of Bhutan’s hereditary monarchy. We begin our day with a visit to Trongsa Dzong, the biggest palace-fortress in the Kingdom reputed to have been built without using a single iron nail. This fortress has for centuries been the vanguard of powerful warriors, one of whom even led successful expeditionary forces against British-Indian army in the southern boundaries of his domain. We complete our Trongsa sojourn with a visit to the Watch Tower, Ta dzong, which is today preserved as the Museum of Bhutanese Kings. The drive to Bumthang is initially an upward ascent for nearly half the journey till we reach the highest point at Yotong La pass (3,400 m). After a brief stopover to view the Black Mountain range, we drive towards Chumey entering the country’s most expansive and beautiful valley known as Bumthang or a Meadow of Beautiful Vase. The women of Chumey are known for their skills in weaving the exquisite Yathra – a clothing with intricate floral patterns woven out of sheep’s wool. This is the valley of myths and legends. One of the oldest surviving man-made structures in Bhutan, a temple dedicated to Buddha Shakyamuni, Jambay Lhakhang, was built in 639 AD as part of an oath by Tibetan emperor Songsten Gampo to subdue a demoness who lay spread-eagled across the Himalayas obstructing the teachings of the Buddha. Our next visit will be the Castle of the White Bird (Jakar Dzong) whose central tower (utse) is the tallest in Bhutan. The castle currently serves as the administrative centre for the district. From Jakar, we drive a short distance to Chakhar and then to Kurjey Lhakhag. Albeit oblivious today, Chakhar is the site of the legendary “Nine-Storied Iron Castle” built by Sindhu Raja (king) in the 8th century and the innumerable myths surrounding it. Kurjey, meaning “Body Imprint on Rock”, has temples built against a wall of cliff. The imprint belongs to the 8th century saint Padmasambhava who mediated in a rock cave and, using his tantric powers as well as guile and guise, subdued the evils who tormented the people in the vicinity. After lunch at our hotel, we drive to Tamzhing monastery which preserves the remains of the works of Terton Pema Lingpa who, in the 15th century, discovered many secret tantric teachings hidden by Padmasambhava. Pema Lingpa was an artist and sculptor extraordinaire but, more importantly, one of the five “King Tertons” – treasure revealers – of Vajrayana Buddhism. Our last visit for the day is the “Burning Lake” in Tang where Pema Lingpa, challenged by a local warlord, took a dive into a pool with a lighted butter lamp on his head and re-emerged from the lake with the lamp intact and holding a hitherto unknown statue in his hands. Today we have a long drive about 193 km, it take 8 to 9 hours drive. Enroute, enjoy the scenery of nature beauty of Snowcap Mountains, flowers, yak and deep forest, you’ll make a stop in URA valley for view of temple and village. Ura Village has a medieval look to it because of the cobblestone streets, and the typical clothing of the women includes a sheepskin shawl. Sengor Valley separates Central from Eastern Bhutan. Eastern Bhutan is the least traveled area of the country and is where many of the kingdom’s most ancient spiritual sights are found. Begin your journey to the East is one of the most beautiful. Out of Ura, the highway climbs steeply to Thrumshing La (the second highest pass, 3,800m-12,465ft.) along the West to East highway. The descent from Thrumshing La to Lingmithang is amazing for a number of reasons. The road drops from 3,800 meters to 650 meters in only a few hours passing from pine forest through semi-tropical forest to orange groves. Arriving at Mongar marks the beginning of your eastern Bhutan experience. Many towns in eastern Bhutan are built on the sides of the hills which contrast to the west where they develop on the valley floor. Mongar Dzong was built in 1953 by the orders of the Third King, Jigme Dorje Wangchuck. Overnight at the hotel. After breakfast drive about 93 km it take 3 hour drive, morning visit the Mongar Dzong. Begin your trip to Trashigang, passing through several villages. In the afternoon, you can visit Trashigang Dzong and stroll through the town, absorbing the culture of eastern Bhutan. Overnight at the hotel. After breakfast drive 48km it’s an hour more to Tashiyangtse is a small town rich in Bhutanese arts and legend. On the drive to Tashiyangtse you pass the small town of Duksum located on the Drangme Chhu and its tributary. It is a few kilometers past Gom Kora A large boulder sits in the garden of Gom Kora (Gom Kora) Temple and its is said that if anyone can climb below the rock and emerge from its summit, he will be forgiven of his sins. Duksum is nothing fancy but it is a small weaver’s town where you can find a fair amount of weavers producing some very nice work. Every year in spring, Chorten Kora is the sight of one of the most famous festivals in Bhutan. Although quite remote the Chorten Kora Tshechu attracts people from all parts of the country. Overnight at hotel. After breakfast drive 154 km. It takes 3 hours to Gauhati Airport.